A fallen tree just missed this home in Fredonia this morning. Winds, gusting to nearly 70 mph, are expected to continue through the afternoon. According to the National Weather Service, there is a high-wind warning until 5 p.m. today. One wind gust reached 67 mph at the Dunkirk Lighthouse while a 60 mph gust was reported in Fredonia and 55 mph at Dunkirk Airport. There also was a 50 mph gust in Farnham. 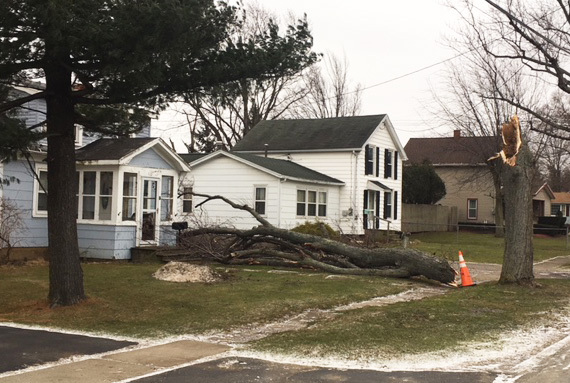 Branches and trees are are reported down throughout the region but, according to National Grid, there were only minor outages reported in Erie County as of 10:30 a.m. today. Cooler temperatures will settle in on Saturday with another warming trend beginning Sunday.